• To the over 25,000+ businesses in Henrico – especially our Legacy Companieswith roots here for 25 years or more, you are the backbone of our economic vitality. Thank you for leading our growth and making Henrico better for business! We wish you every success in the new year. 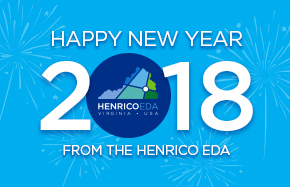 • To the 326,501 citizens who call Henrico home – thank you for making Henrico a smart, diverse and vibrant county where people of all ages can thrive. We wish each of you a healthy, happy 2018. It’s a privilege to serve you. Thank you again for making Henrico County a place where businesses and people come for success – and stay for life!